Canada finds new ways to boost a workforce and depends on many talented workers. Moreover, there are several Canada immigration programs, for attracting the best workers with the right skills. Candidates also always aim to improve their chances of success and must know regarding the provinces/territories which lookout for the skilled overseas workers in the country. Furthermore, Canada has a plan to achieve new immigration targets for the present year for applicants in each visa program. We present the biggest immigration programs in the country. As per a report by Statista, a popular choice for many immigrants – is Ontario. It was also the permanent home to 98,409 people in 2017. Moreover, in 2018 the province had 40% of new immigrants which made it a top destination for immigrants. 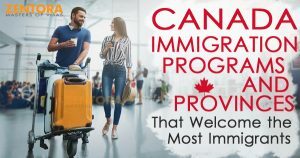 Mainly the reason for a high immigration level is that the province constantly creates unique immigration programs, like the Human Capital Priorities Stream, which allows nominated applicants to apply/qualify for immigration within 2-3 months. There is a fine post landing service to ease out the successful qualifiers. Additionally, there is an Ontario Bridge Training Program, offering support and training to obtain the trade license or get a good job. These streams are designed for specific occupations that are important for the growth of Ontario. A feature of these streams is fast and efficient processing times to help the people in migrating to Canada successfully. Quebec is the next popular province for immigration in Canada. In 2017, it attracted 53,199 PRs. The Quebec Skilled Worker Program enjoys popularity here. Quebec aims to issue nearly 40,000 new PRs by 2019 and as many as 59% of them will come through the QSWP. Quebec Self Employed Worker Program. Together these will attract 3,200 applicants who establish successful companies in the province. Its Immigration Minister, SJ Barrete said that the new immigration plan will ensure the persons arriving here are integrated into the province. The Government will also ensure that employers have access to skilled overseas workers. BC had 35,388 PRs in 2017 and offers select immigration programs that are specific to in-demand jobs. The aim of the province is maintaining a young and talented workforce. Furthermore, it has created several immigration programs for global graduates/postgraduates who pursue their studies in the province. Through them, the provincial graduates get a chance to become PRs when they meet the program requirements. Finally, there are nearly 70 different immigration streams and categories worth applying. Know the perfect solution for meeting your immigration needs, or also seek our help. We will be eager to answer any questions in this regard.